AC/DC are set to hit the road in 2015, having announced 20+ dates through Europe from May to July. 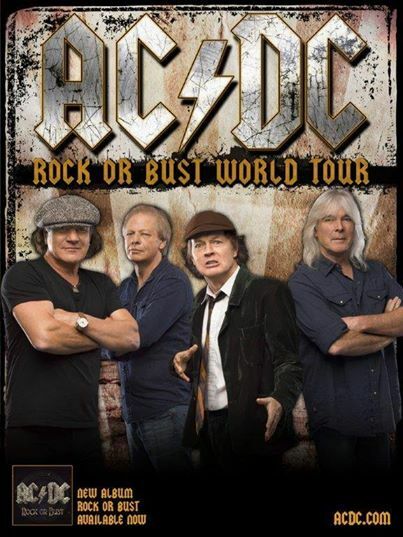 The tour is in support of their 2014 album, Rock or Bust. Unfortunately, founding member / rhythm guitarist Malcolm Young won't be on the tour because he left the band earlier this year to receive treatment for dementia. It's unknown whether drummer Phil Rudd will be on the tour, as he's currently facing legal issues in New Zealand. In spite of these personnel issues, AC/DC are likely to deliver some rockin' shows as only they can. When Do AC/DC tickets go on sale? Tickets for some shows are already on sale. Other shows, including the show at Wembley Stadium in London, don't go on sale until Wednesday, December 17th. Click the primary ticket seller links below for more information on each individual concert. For the latest music, news, and tour dates for AC/DC, check out their Zumic artist page.